As part of National Alzheimer’s Awareness Month, BrightStar Care is sharing stories, with permission, that showcase real, personal stories of connections between clients, family care partners, and BrightStar Care [caregiver]s.
We had the honor of speaking with several families and [caregiver]s from around the country to learn more about how their BrightStar Care [caregiver]s have made a difference in their lives and the lives of their loved ones. Families communicated examples of person-centered connections, such as visiting car showrooms to entertain one man’s lifelong love of cars, creating a classroom-like setting of activities to engage one woman’s mind and warm her heart with fond memories of teaching kindergartners, and using a stuffed toy dog to mimic the feeling of a beloved pet on one woman’s lap. 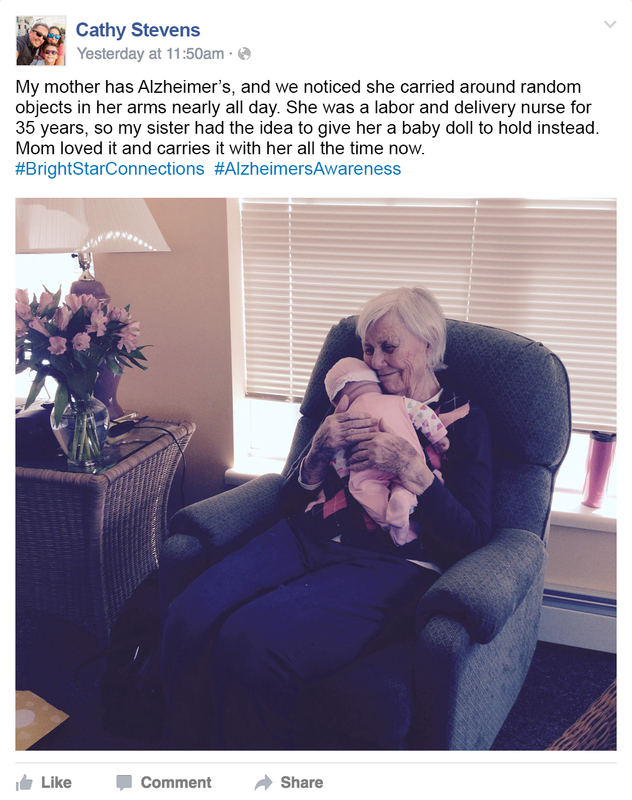 These types of connections are possible because of the [caregiver]s' warm and compassionate personalities as well as the BrightStar Care approach to enrich the lives of their clients with person-centered care that preserves dignity, provides assistance and promotes activity. Additionally, Registered Nurse oversight of every client's plan of care makes BrightStar Care well poised to respond to behavioral expressions which can be challenging for family [caregiver]s.
Robert’s in-home [caregiver] helped him keep up with his passion for automobiles with visits to auto shows and museums. "Those Are My Momma's Words"
When Miss Sue’s memory started to fade, her [caregiver] began to write all of her stories in a book that could last forever. Learn how [Caregiver] Beata uses water to connect with Len’s memories of the lake house and his time in the Navy. Do you know a [caregiver] who has formed a special connection with a loved one living with Alzheimer’s or dementia? How have they made a difference in your loved one’s life? Topic: Navigating the Holidays: How to celebrate the holidays safely with your loved ones living with Alzheimer's and dementia. Don’t forget to like our Facebook page so you are sure to see all of the helpful tips and information we share about Alzheimer’s disease as well as get ideas to help care for a loved one with dementia all month long.